French independent developers Seaven Studio have a lot riding on Ethan: Meteor Hunter. After the closure of Hydravision Entertainment in 2012, a handful of the team got their life savings together and formed Seaven Studio. Taking the indie plunge allowed them to keep Ethan: Meteor Hunter alive, and the game marks the first release of the newborn studio. A puzzle platformer with a telekinetic mouse as its star, Ethan boasts fifty levels over the course of three different game worlds, with a variety of play styles to mix up the action. There’s an even balance between the puzzle and platform elements of the game, and as it is swift to tell you, “Winners don’t use drugs. They use a gamepad”. The first thing to say is pay attention to that warning about the gamepad. Whilst the mouse and keyboard does work it is by no means as comfortable or as fluid as using an Xbox 360 or PS3 controller – for the best experience plug in! As well as the usual jump and move staples Ethan also has the ability to slide, and somewhat more unusually, stop time and move objects with his mind. The ability is limited by the number of pause tokens that the player picks up, and not every object can be chucked around at will. Instead Ethan can only move certain objects within a given area, and uses up a token every time time is stopped and an object is moved. The developers have made great use of the mechanic, throwing in numerous different gameplay styles that range from Professor Layton like block shifting puzzles to switching around platforms with precision timing. Any gaffs are quickly erased by a nifty rewind button that takes you back to the nearest checkpoint, and the ability to rotate objects is sapped of frustration by being able to snap them into the more useful angles. The physics system is very precise, and together with the tricky nature of the level design demands the full attention of the player – some of the puzzles may not be kiddie friendly and the degree of accuracy that some of the block shifting demands can be a little frustrating. 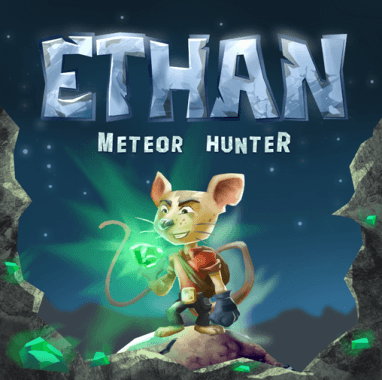 Ethan: Meteor Hunter is one of those platformers that can produce a great deal of frustration, but it is frustration of the best kind- a “I’m going to get past this if it’s the last thing I do!” kind of feeling. Whilst it starts off in a fairly kind way, the game quickly builds the challenge level -it throws in plenty of unexpected pitfalls and seemingly impossible set ups, as well as pogo stick and flying levels and chase sequences to keep players on their toes. 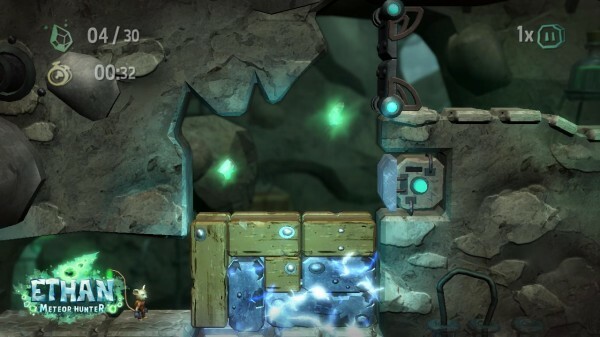 Puzzles and platforming sections alike are made more complex by the fact that wooden platforms will burn, metals ones will conduct electricity and some will fall apart upon landing. Timing is a must, and the puzzles are demanding enough to fire up the old grey matter. As one trailer of the game is keen to point out, there are many and more ways to die in Ethan: Meteor Hunter. And unless players have ninja like reaction times, Vulcan logic and more luck than the Irish there is no way some of the later levels are not going to electrocute, squash, shred or otherwise kill off poor old Ethan at least five times a pop. Thankfully the check points are fair and respawning is quick, so it is very easy to just keep going – timer be damned! As well as being ranked by time, every level also dishes out ratings based on how many pause tokens are used and the number of meteor fragments collected. The fragments can often be scattered in places that require extremely well timed platforming skills, so bundle that with some block puzzles that simply aren’t going to be cracked instantly and there is plenty of reason to revisit the levels. 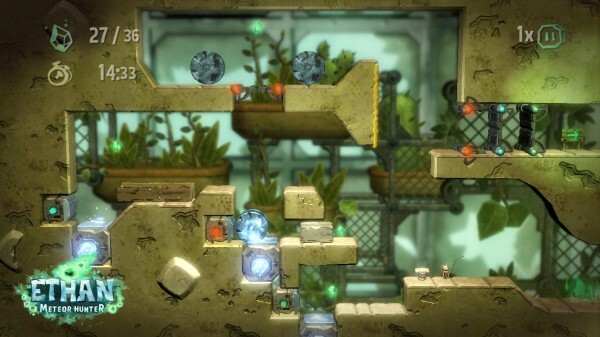 Ethan is a side scrolling platformer with a simple cartoon style reminiscent of Little Big Planet. Whilst not as detailed as Craftworld there are still some dynamic touches to the backgrounds and levels that give each of the three worlds a distinct theme. The presentation is clear and crisp, and although Ethan isn’t the most complex character model he still gets some funny death animations that add a touch of personality to the game. But why does he fall asleep so quickly? When new gameplay elements like electricity or mousetraps are introduced the visuals make the new ideas easy to grasp without the need for pace killing tutorials, allowing players to get on with the business of dying in new and unexpected ways! The audio elements of Ethan: Meteor Hunter are solid. The effects and the music have a bit of a sci fi bent to them, and the themes for each level match up with the visual motifs of the three worlds. The music has some bounce to it which grows as you progress through the level. What the game is lacking is any vocalisation for Ethan, as kooky as his death animations are it would have been great to have some exclamations to go with them to give him a bit more personality. As it is the game is a little lacking in that department, but it’s a forgiveable slight given how good the rest of it is. Ethan: Meteor Hunter is a great puzzle platformer that at it’s best is reminescent of Crash Bandicoot. Inject Ethan with a little more pizzazz and give the whole thing more story and humour and Seaven Studio could have a real treat on their hands. 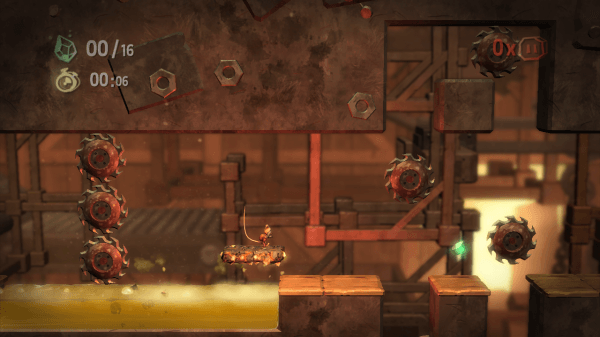 The telekinesis mechanic is implemented extremely well and the difficulty will keep even seasoned platformers on their toes. The gameplay and execution are top notch, all Ethan needs is a little more flavour.